On the fence about a Great Wolf Lodge family vacation? 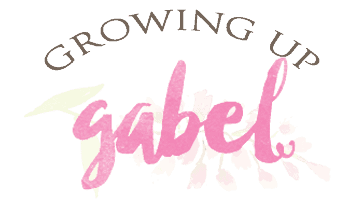 Check out our stay at the Great Wolf Lodge California and see why you need to book your stay TODAY! The Great Wolf Lodge provided a discounted rate for our family to visit, but all opinions our my own. My kids started asking to go to Great Wolf Lodge after seeing a TV commercial. I'd actually been wanting to visit a lodge for years, but there wasn't one near us. Finally, in 2016, Great Wolf Lodge opened a resort in Southern California (just down the street from Disneyland) and I knew our time was coming. 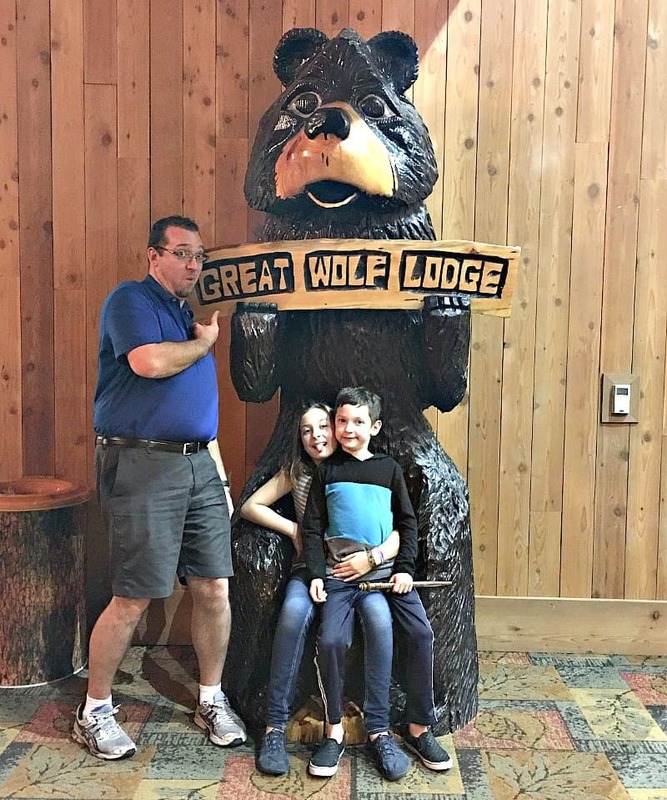 I did some research on visiting Great Wolf Lodge and the prices scared me off. 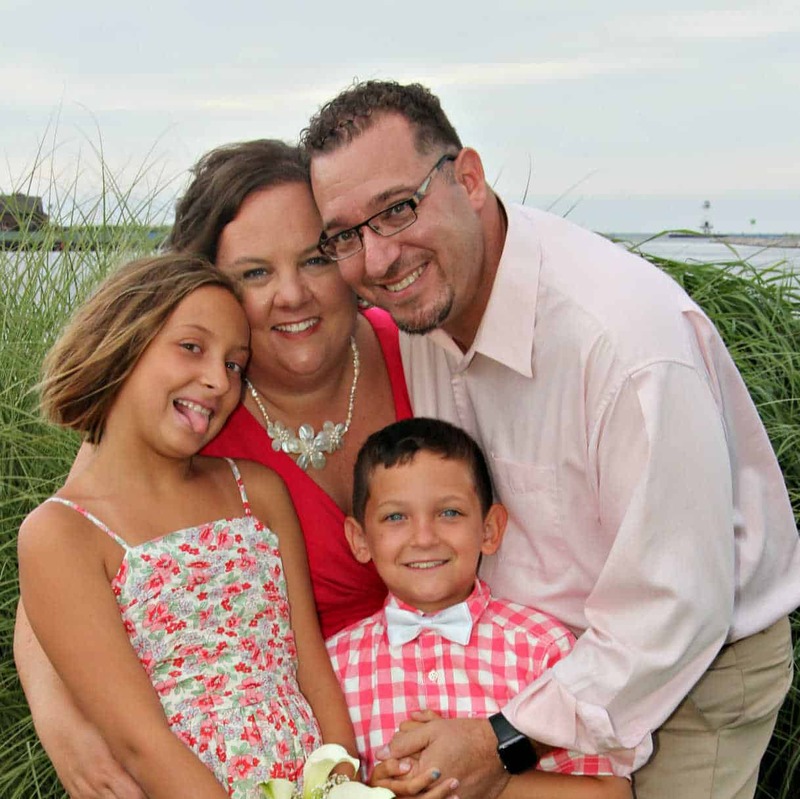 Our normal family vacations include camping in a tent or staying at a budget hotel. Our vacation budgets are on the frugal side. Even with a generous discounted rate, the resort felt out of our price range. But after our visit, we're planning to go back every year! 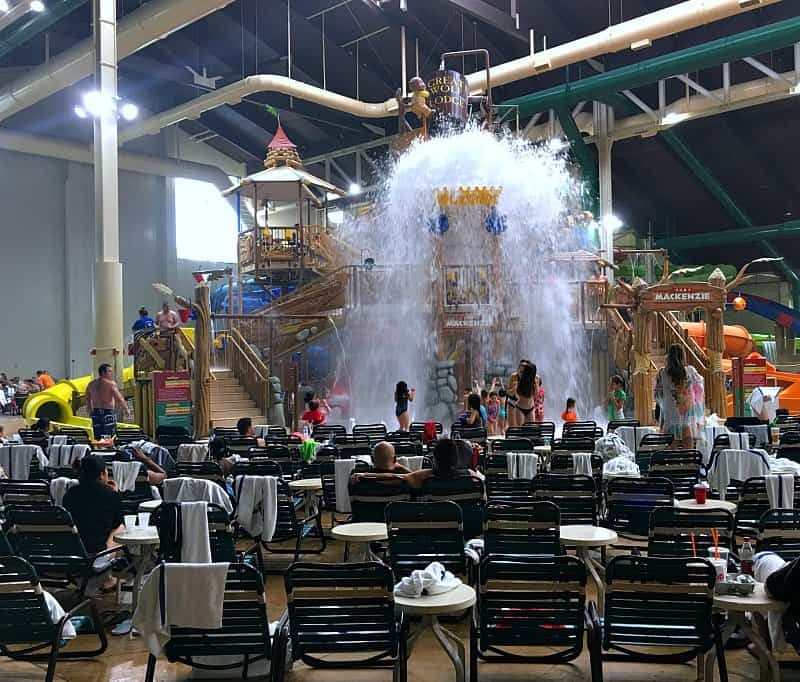 Great Wolf Lodge is so much more than a hotel with an indoor water park. It is a one stop vacation spot for family fun. 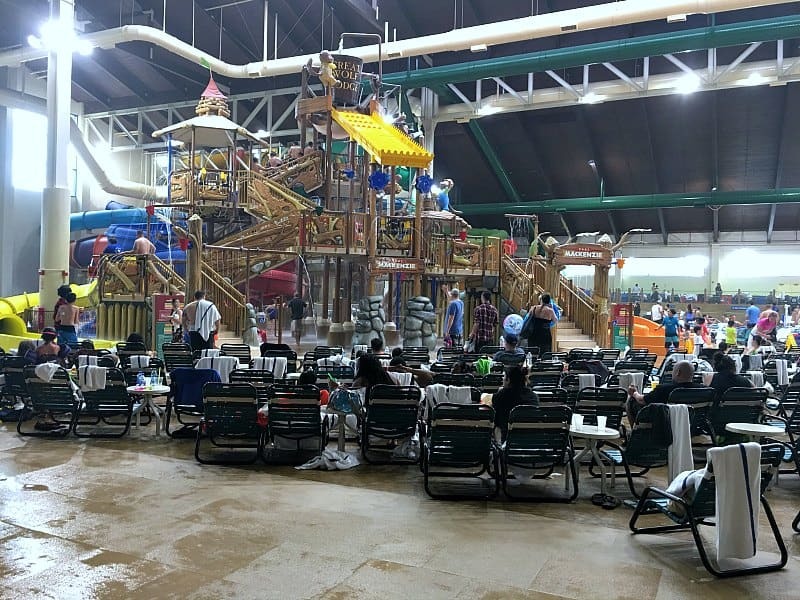 Water Park: Great Wolf Lodge of course offers the indoor water park, which is included with the price of the hotel room. The water park has something for every age and ability from babies on up. We stayed during a holiday weekend so the park was pretty crowded, but they have plenty of seating. The afternoons were the busiest times and mornings and evenings were the least crowded. 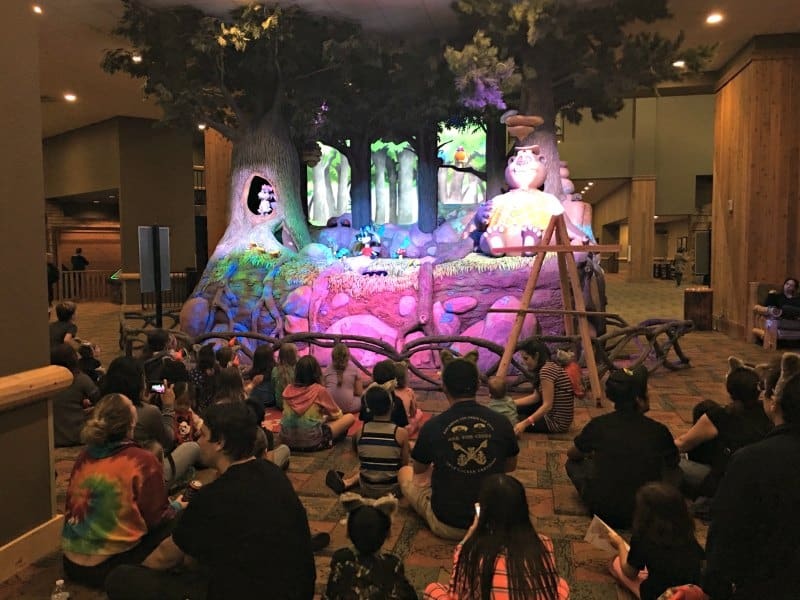 Free Activities: Great Wolf Lodge offers a lot of free activities outside of the waterpark. Wake Up with Wiley and Friends is a free morning activity before the water park opens for your little early risers. The Lunchtime Lineup includes face painting, crafts, and balloons! And in the evening you can head to the lobby for storytelling, games, a dance party and pajama parties. Kid Sized Attractions: The Lodge is a kids dreamland of fun things to do. The Lodge offers kid sized bowling, an arcade, a make your own stuffed animal store, a kid sized spa, mini golf and more. 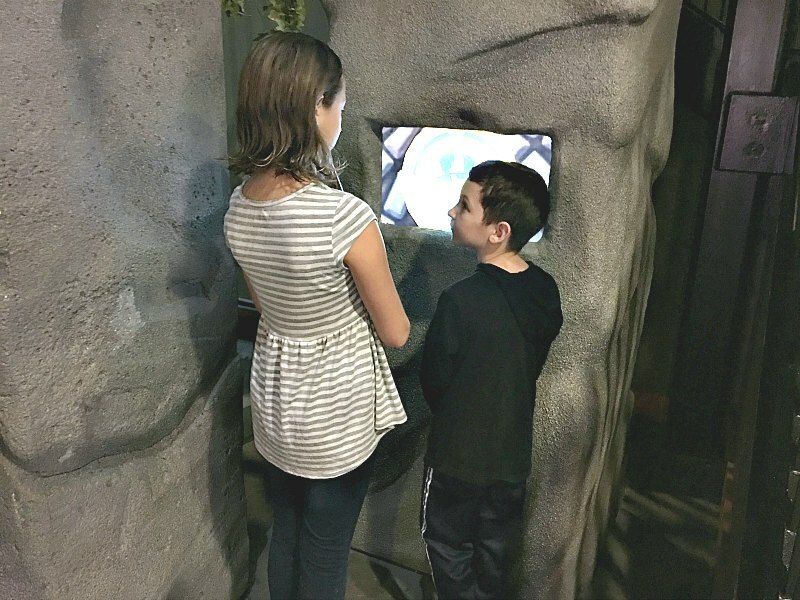 One of the most unique attractions at Great Wolf Lodg is the MagiQuest game. MagiQuest is an interactive game where kids run around the lodge finding treasures and interacting with different game pieces. You will need a wand and purchase a game to play this. We bought one wand one game to share. But I'd recommend the PawPass. These attractions do cost extra. The best deal if you want to do them all is the Paw Pass. Buy this when you book to save money, but it's also available on site. We didn't get them and I wish we had – at least for our first trip. Many of these attractions are open later in to the night so if you have night owls, you definitely are stuck in your room! 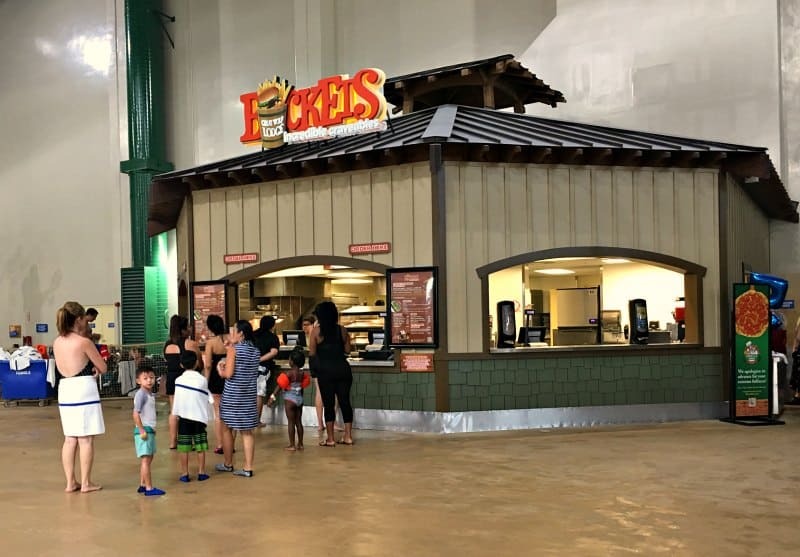 Family Friendly Food: Great Wolf Lodge offers a lot in the food area right on property. In fact, we ate all of our meals on site. The resorts offers a pizza place, ice cream, a buffet, pool side dining and a sit down restaurant. There was also a Dunkin' Donuts on site for a quick breakfast or coffee. Each resort is a little different so check out your property to see what they offer. You can purchase meals when you book for a discount and I'd definitely do that if you are planning to eat at the Lodge. The Lodge in California is also near many restaurants so eating outside the lodge is also an option. We were just too comfy to want to get in our car to go anywhere! 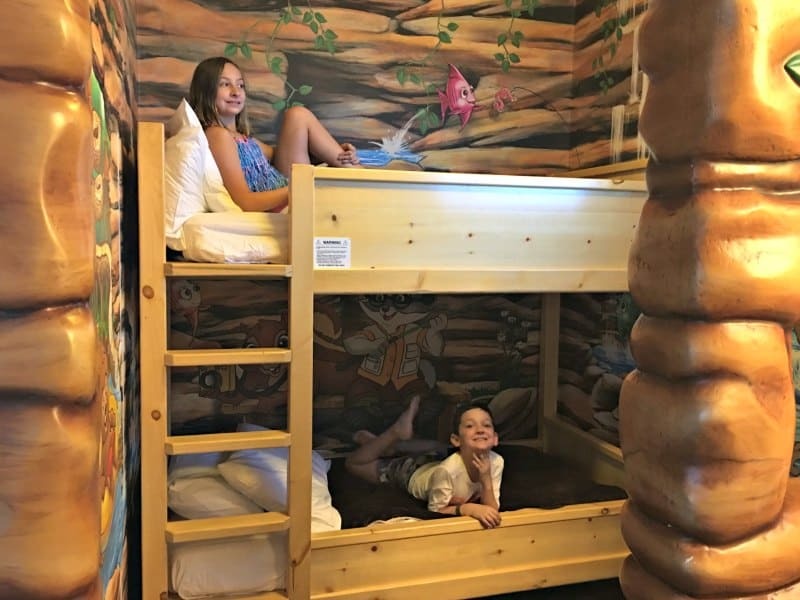 Fun Accommodations: Great Wolf Lodge offers several different room types from a normal hotel room set up to upgraded Wolf Den rooms or even larger suites to accommodate more people. We upgraded to a Wolf Den room, which includes a little sleeping “cabin” with a bunk bed and a TV for the kids. If you purchase a wand, the room with interact with it. The bunk beds were super fun, but not necessary to have a great time. So if you can't swing the upgraded room, just book a standard room. I promise you will still love this place! Ask for a room that is not near the MagiQuest games. The games are on certain floors and near rooms and kids will be running around late playing. So just avoid it by staying on a higher floor without it. I can't recommend a trip to Great Wolf Lodge enough. The Lodge is a one stop resort for family fun. 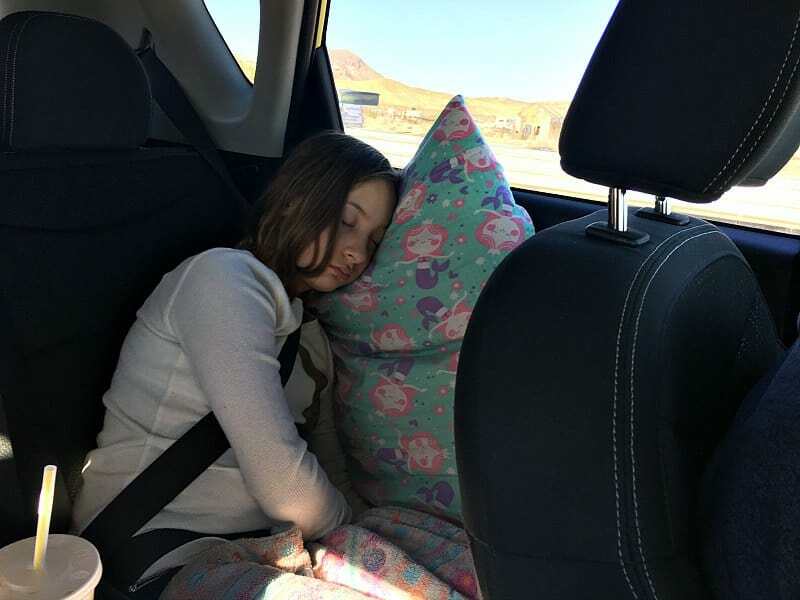 I can count on one hand the number of times this girl has fallen asleep in the car since she was born. She slept the entire 4 hour car ride home from Great Wolf Lodge! Now that's what I call a successful vacation. Ready to go? Click here to check rates and book an awesome family vacation you will love! Great place! I think this is the best place for family vacation. Is this related to the Great Wolf Lodge in Washington? It looks like they have so much more there than I expected. Yes! 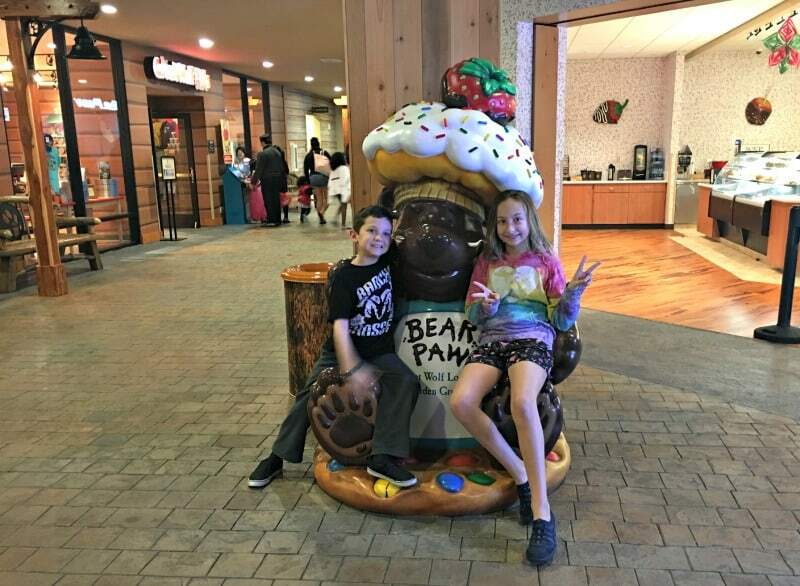 We visited the Great Wolf Lodge in Southern California, but they have resorts all over the US. Definitely more than we were expecting!